The Urban Politico: Someone Please Build A Time Machine and Send Them Back To 1955! Someone Please Build A Time Machine and Send Them Back To 1955! I try my very best to ignore people like Peggy Noonan. She frequently says stupid things that I disagree with. Case and point, when asked about what to do about the fact that there is proof that the previous administration committed international war crimes she said, you should just turn away and keep on walking. Gotta love those Conservative Christian values! So this week she writes in her column (below) that America has a character problem and she cites American Idol runner-up, Adam Lambert as evidence of this. The news came in numbers and the numbers were fairly grim, all the grimmer for being unsurprising. A Wall Street Journal/NBC News poll reported this week that more than half of Americans, 55%, think America is on the wrong track, with only 33% saying it is going in the right direction. A stunning 66% say they're not confident that their children's lives will be better than their own (27% are). It is another in a long trail of polls that show a clear if occasionally broken decline in American optimism. The poll was discussed on TV the other day, and everyone said those things everyone says: "People are afraid they'll lose their jobs or their houses." "It's health care. Every uninsured person feels they're one illness away from bankruptcy." All too true. The economy has always had an impact on the general American mood, and the poll offered data to buttress the reader's assumption that economic concerns are driving pessimism. Fifty-one percent of those interviewed said they disapproved of the president's handling of the economy, versus 42% approving. But something tells me this isn't all about money. It's possible, and I can't help but think likely, that the poll is also about other things, and maybe even primarily about other things. Sure, Americans are worried about long-term debt and endless deficits. We're worried about taxes and the burden we're bequeathing to our children, and their children. But we are concerned about other things, too, and there are often signs in various polls that those things may dwarf economic concerns. Americans are worried about the core and character of the American nation, and about our culture. It is one thing to grouse that dreadful people who don't care about us control our economy, but another, and in a way more personal, thing to say that people who don't care about us control our culture. 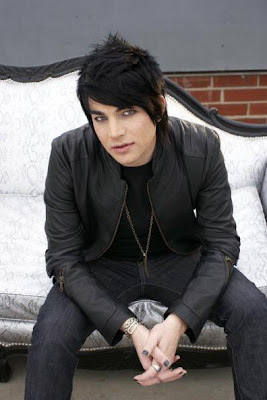 In 2009 this was perhaps most vividly expressed in the Adam Lambert Problem. More on that in a moment. America is good at making practical compromises, and one of the compromises we've made in the area of arts and entertainment is captured in the words, "We don't care what you do in New York." That was said to me years ago by a social conservative who was explaining that he and his friends don't wish to impose their cultural sensibilities on a city that is uninterested in them, and that the city, in turn, shouldn't impose its cultural sensibilities on them. He was speaking metaphorically; "New York" meant "wherever the cultural left happily lives." It's things like this, every bit as much as taxes and spending, that leave people feeling jarred and dismayed, and worried about the future of their country. Truly, 2009 was a bad year for public behavior. There were this year the party-crashing Salahis and their amoral assumption that their needs—fame and fortune, which are the same as Adam Lambert's—trump everyone else's. You want public order and security? We want a reality show. And there was their honest and very modern shock that people were criticizing them. "It's ruined our lives," Michaele Salahi told NBC's "Today" show in a bid for sympathy. She and her husband in turn were reminiscent of the single woman who likes to have babies, and this year had eight, through in vitro fertilization, and apparently expected to win public praise. All these things—plus Wall Street and Washington and the general sense that most of our great institutions have forgotten their essential mission—add up and produce a fear that the biggest deterioration in America isn't economic but something else, something more characterological. So much always roils us in America, and so much always will. But maybe as 2010 begins and the '00s recede, we should think more about the noneconomic issues that leave us uneasy, and that need our attention. Not everything in America comes down to money. Not everything ever did. Okay so Peggy, WHAT THE EFF ARE YOU TALKING ABOUT HERE EXACTLY?! Why can't we send you back to 1955, along with Pat Buchanan where the only responsibility black people have in that version of America is to run fast (see in clip below he actually said that on live tv) and the gays were forced to remain in the closet. We really should get back to that! And another thing Peggy, I actually watched the AMAs (It's apparent from the text of your column that you only heard about the controversy at the water cooler). Adam's performance was at 11pm EST. He literally was the final performance of the night. So Peggy, why is your 8 year old still up?! I really wish we could put all of you old timers on a time machine and send you back to simpler times, like on the TV show Mad Men, where our moral values were to be envied. Oh wait...No that's wrong because everyone on Mad Men is living a LIE! 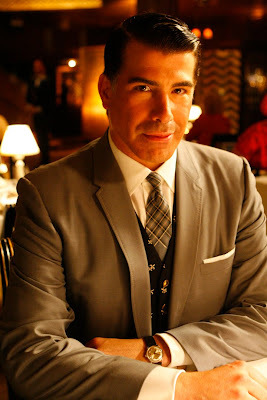 Someone please tell Peggy that men like Mr. Lambert have always been a part of the American fabric, it's just that in the past, we forced them to pretend to be straight, get married, and have kids like Salvatore Romano (above). Personally, I'm in favor of a more open society and I think that people like Adam Lambert should be free to be who they are without getting called out by the Wall Street Journal Editorial page. Plus, Adam Lambert makes good music.